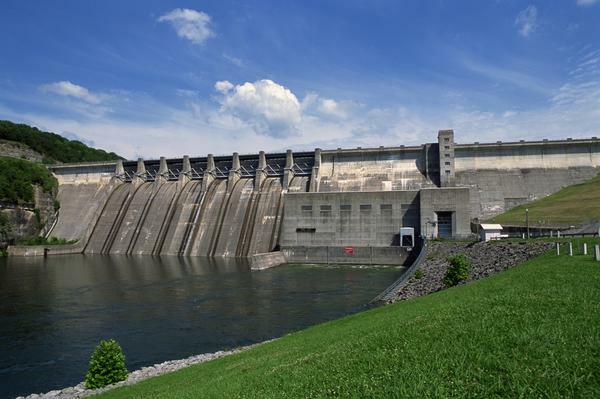 What are Hydroelectric Power Plants? Hydroelectric power plants are the systems which generate electricity following the law of conservation of energy and the gravitational law. They are composed basically of a water reservoir, turbines, electric motor or generator, rotors and stators and channeling pipes. The mechanism of hydroelectric power plants follows the transference of kinetic energy of flowing water to mechanical energy of the blades when the water strikes with them forcefully. The movement of the blades is transferred to a generator which builds up a strong electric field thus producing electricity by the flow of electrons. This electricity is then transferred to the consumers via channeled vessels. The amount of electricity produced depends upon the difference in the heights of water called ‘head’ and the volume of water flowing. There are many types of hydroelectric power plants. Their selection depends upon the volume of water available and the flow of water. It also depends on the area which is available to us and the money we want to spend. There are very large power plants like micro hydro plants as well as small plants which can also be built near your home as they do not cause much damage. This system actually works on the demand for electricity. It uses different elevations between two reservoirs for water pumping, depending on the requirement. When the requirement for electricity is less; then the excess of generation power pumps the water into a slightly higher basin. In case of higher demand the turbines releases back water into a low reservoir through it. The pumped-storage is commercially the most important form of storage energy and it also enhances the daily capability factor of the system. This type doesn’t have the storage or reserving capacity. The water flows and passes through the turbines. It is continuously moving and should not remain static. So the water coming from upstream should be used at the moment or it should go around the dam. The tidal waves produced in the oceans which rise and fall due to the attraction of the moon to earth, can be used for the generation of electricity. These systems are predictable as we know when the moon raises tides so the system can be built accordingly. And if such a system is built then it has advantages like dispatchable generation which means that the generation of electricity can be stopped on the basis of requirement. Waterwheels are used instead of a dam which convert kinetic energy rather than potential is less common systems. This system works on the basis of large natural height difference which can be generated by the use of two waterways which can be waterfall or a mountain lake. The underground tunnel is built for the flow of water from the higher sink to the generation site and a horizontal tail race which takes the water to the lower sink. They come basically in two types depending on the head which is the height difference and accounts for the pressure. These types are low-head and high-head. A fast moving stream is an example of a low – head system and a waterfall of high-head system. They are very large and powerful systems.